Since mesh Wi-Fi systems are the hottest trend in home networking right now, BGR recently tested every single top mesh solution out there. The competition was fierce since there are so many great options out there right now, and the winner ended up being the AmpliFi HD. That said, the Orbi Home WiFi System by NETGEAR came in a close second thanks to its stellar design, simple setup and top-notch interface. The Orbi solution is a bit pricey though, but right now there’s a rare sale on Amazon that slashes $50 off the Orbi Home WiFi System, so take advantage of it while you can. Oh, and did we mention that Orbi lets you control your home network with voice commands thanks to Amazon Alexa compatibility? Get rid of WiFi boosters or extenders; two Orbi cover up to 5,000 square feet with high performance WiFi that work seamlessly together. 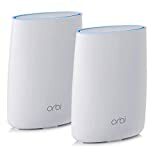 Orbi’s Tri-Band WiFi creates a dedicated wireless connection between the Orbi Router and Satellite delivering the fastest Internet speeds similar to a wired ethernet connection. Guest WiFi network—Easily setup separate and secure Internet access for guests.